I thought I was done with Greece for a while but it turned out, not exactly. 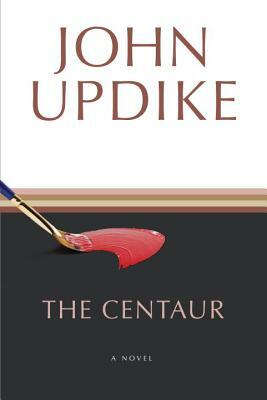 The Centaur is John Updike's third novel, it won the National Book Award in 1964, and is a loose retelling of the Greek myth of Chiron, noblest of all Centaurs. George Caldwell is Chiron. It is 1947 and George is unhappily though gratefully employed as a high school teacher in the small Pennsylvania town where some of Updike's novels are set. The story takes place over a few winter days in the life of George, his wife and his son. In the myth, Chiron was wounded by a poison arrow. The wound never healed, the pain never lessened. As a Centaur he was immortal but, longing for death, he traded his immortality as atonement for Prometheus, who defied the gods by stealing fire and giving it to mankind. Prometheus plays a large part in Circe, the novel I read a few weeks ago. This novel probably follows the myth more closely than I was willing to work for. I was content to enjoy Updike's tale while I noted that sometimes George appeared as a Centaur but most times as a man. He consistently appeared as an emotionally wounded man. The chapters alternate between George and the first person voice of his teenage son. That son has dreams of being a painter, is frustrated beyond endurance by his father, and yet tries to understand him. I love John Updike's writing. Whether in description, dialogue or action, every word contributes to creating his tale. Therefore, even though the connection to the myth was tenuous for me, I was thoroughly absorbed in this novel about a husband and father who knew he was flawed but gave all he had to his family. Sounds good, though I would prefer a retelling more in the vein of Circe (more mythological and less metaphorical in scope). I'm glad that you enjoyed the narrative and the writing style, being a fan of the author. It wasn't that kind of book. But having read so many of the Shakespeare retellings in the last couple years, I could appreciate what he did. Sounds like a lovely read. I read a John Updike novel in high school and didn't enjoy it, but perhaps I didn't enjoy his writing as maybe I wasn't quite ready for what he had to offer as a writer. Oh right. I would not have been ready for John Updike in high school. Updike was a stupendously talented writer. I think the thing I enjoyed about him most was his meticulous use of language. As you indicate, it would be difficult to lose one word without changing the meaning of the narrative. I've read many of his books but not this one. Perhaps I'll get to it one of these days. I have only scratched the surface when it comes to Updike. I sure look forward to reading the rest of his novels. He was a real writer, he wrote everything and it shows. You will surely love The Centaur when you get to it. Yes there is always a first time! Gosh I didn't know Updike wrote this myth derived story. Interesting. I have read a bit nil of Updike, Roth and Bellow .... so my literary pedigree is not too good. Of them, I'm most interested to read Roth, especially his last ones. It sure was a surprise to me! I like all three of these old white men writers, each for different reasons. Updike mostly for his impeccable writing style. Bellow for how boisterous he is. At this moment, I forget why I like Roth. Sorry, it is so hot here!